It was a video game day. The last weekend until Christmas break that absolutely nothing is going on. They are sooooo enjoying the calm before the storm, as are Hubba and I. Nick and Joe will be swimming, Tony will be playing footbal, Joe and Nick will be playing flag football, and Joe soccer. Oh how we are enjoying the quiet of today! Nick took a break from braiding during the summer. But he is back and is a braiding maniac. 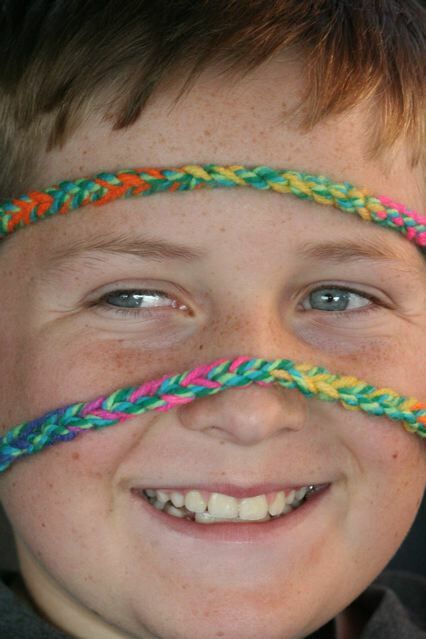 His current braiding artwork involves twenty pieces of string together to form a rope like scarf-ette. The one on his face is the necklace he made for me to wear the first day of school!